Humans are hardwired to care about what others think – we are predisposed to seek validation so that we can feel good about ourselves. We can say over and over that we do not care about the opinions of others, and some of us might not care what most people think, but we all have at least one person that we want to impress or make proud, one person that we do not want to disappoint. Cannabis has been a source of disappointment for many parents, friends, teachers, employers, and coaches throughout history. This sense of disappointment upon discovering that a person you care about is consuming cannabis stems from a deep-rooted misunderstanding of the plant and the people who partake in its benefits. In the early 20th century, Reefer Madness and other federal propaganda painted cannabis as a mind-numbing gateway drug. Still to this day, cannabis in the United States is categorized as a Schedule 1 substance, which puts it in the same classification as heroin. This narrative gave way to the stoner stigma, which says that cannabis consumers are lazy and unmotivated. But, as people from all walks of life – parents, professional athletes, and senior executives of multi-million dollar companies alike – begin to speak up about cannabis and how they enjoy its various benefits, we see that the gateway drug and stoner moniker do not ring true. As the veil lifts, more consumers are finding that they can enjoy cannabis without having to worry about being subjected to any judgement from others. Under California law, edibles must contain no more than 10 milligrams of THC per serving. When you purchase an edible with a label that says it contains 2.5 mg, 5 mg, or 10 mg of THC per serving, you can rest assured that your edible will contain that amount. Edibles that are not compliant with California’s dosage regulations cannot be sold in licensed retail locations. The strict regulations that accompanied the legalization of adult-use on January 1, and the further regulations introduced on July 1 have allowed edibles to become the ideal option for consistent dosing. It’s easier to eat the same size edible that contains a reliable and trusted dosage than it is to roll the same size joint containing the same amount of flower from the same strain of cannabis, and consume the same amount by taking the same size pull. We’ll stick to unwrapping an edible and continuing about our day. Edibles provide a discreet way to partake in cannabis. 3Leaf edibles in particular contain cleanly extracted THC or CBD distillate that is void of terpenes, the compound that gives cannabis its taste and smell. When you eat one of our Strawberry or Blood Orange Fruit Jellies, or our Quinoa Granola Bites or Coconut Oatmeal Cookies, all you’ll taste is the delicious ingredients. You’ll have no need to worry about smelling like cannabis when you arrive at wherever you need to be. Another benefit to edibles is the fact that they are sealed in compact packaging. It’s easy to put a container of 3Leaf in your gym bag, or fit a bag of our Fruit Jellies in your purse. If you prefer to take one or two edibles for your day, 3Leaf edibles comes individually wrapped, making it easy to grab and go! 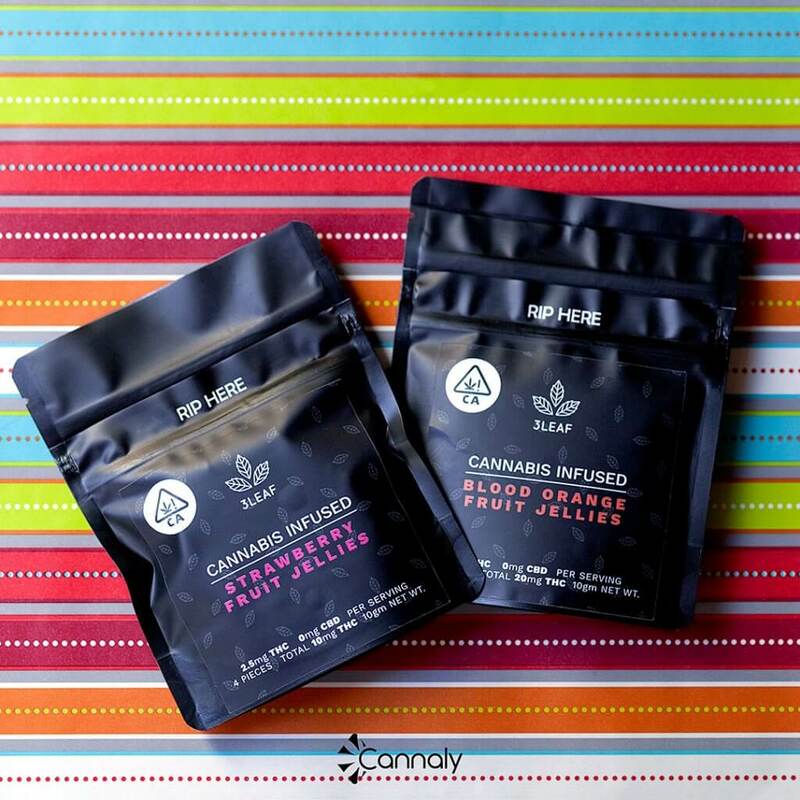 3Leaf’s new all-natural Fruit Jellies in particular are a great introduction to cannabis. They are one of the only products available in California that cost less than $10 per package. And, each package contains four fruit jellies, so you don’t have to make a significant commitment the first time you decide to try cannabis. It really is the perfect time to try cannabis. While certain people may still judge those who partake in cannabis, there is without-a-doubt a cultural shift taking place that is moving towards the acceptance and appreciation of cannabis. This is in part because of California’s strict regulations that give consumers access to safe cannabis products from licensed manufacturers and retailers. It’s much more likely to have a consistent and effective cannabis experience from the edibles offered today. And now there are so many more delicious and healthy options for edibles that contain a dosage that will meet your needs – you’re sure to find something that fits your lifestyle.